What shapes a meaningful conversation with people whose sense of self has been fractured by witnessing the horrors of genocide? In such conversations, who controls what is meaningful and worthy of discussion, remembrance and action? Alexandre Dauge-Roth, recipient of Bates’ 2015 Kroepsch Award for Excellence in Teaching, devoted his Kroepsch lecture on March 18 to a thorough analysis of those questions — specifically as they pertain to his decade of engaging Bates students with survivors and their stories of the 1994 genocide against the Tutsi in Rwanda. And whether or not he ever used the words “power” and “ownership” during his late-afternoon lecture, those concepts were the floor his talk stood on. How do power relationships play out in the dialogue between a trauma survivor and that person’s interlocutor? Who owns the survivor’s story, the space in which it’s heard and its retellings? Most important, what is the interlocutor’s ethical and civic obligation to the survivor? Associate professor in French and francophone studies, Dauge-Roth is internationally known for his research into personal narratives from the genocide, work represented by his 2010 book, Writing and Filming the Genocide of the Tutsis in Rwanda: Dismembering and Remembering Traumatic History (Lexington Books). 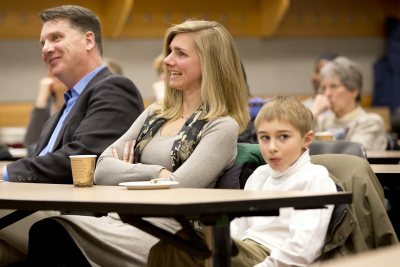 Dozens of students, colleagues and friends offered a warm welcome to this scholar and teacher who, in his 10th year at Bates, “received many, many nominations for the Kroepsch,” as Dean of the Faculty Matt Auer said in introducing Dauge-Roth. Dauge-Roth’s talk was titled The Transformative Power of Literary and Testimonial Encounters. Revealing a mentality scrupulous in both its morality and its attention to the ramifications of an idea, the hour-long talk traced an arc from Dauge-Roth’s own studies, in his native Switzerland and at the University of Michigan, to the thinking behind signature courses that he introduced at Bates. Both courses, “Documenting the Genocide of the Tutsi in Rwanda” and “Learning with the Orphans of the Genocide in Rwanda,” were driven by interaction between Dauge-Roth’s students and genocide survivors. The latter, a Short Term unit, has twice brought students to Rwanda. 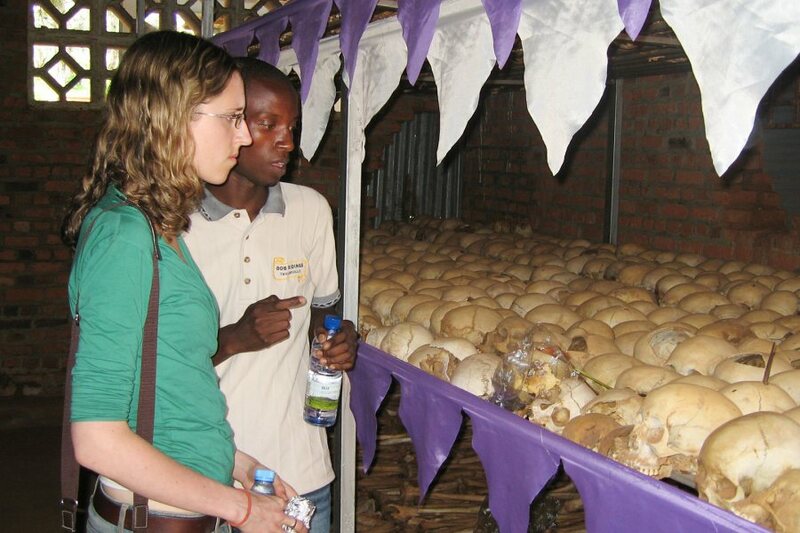 Together, Sarah Bravmann ’12 and Alexis Mutimukunda face a genocide exhibit of human skulls at the Ntarama Memorial in Rwanda during the Short Term course “Learning with Orphans of the Genocide in Rwanda” in 2009 led by Alex Dauge-Roth, associate professor of French and francophone studies. Inspired by research conducted for his graduate degrees, notably his work at Michigan with the personal testimony of people living with AIDS in France, Dauge-Roth focused on the literature of survivors of the genocide — biographies, diaries, oral history and film. “Interactions with survivors of genocide is not only about the past and grievance but also about sharing laughter within the present despite of it all,” says Dauge-Roth. 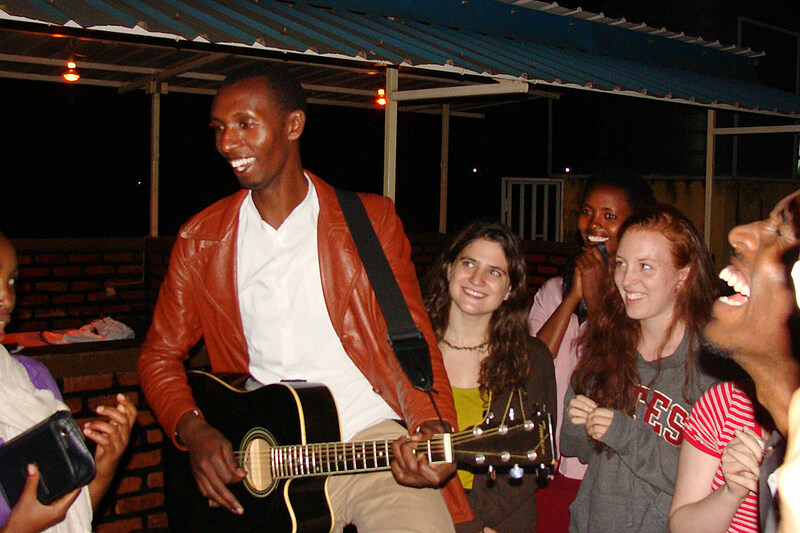 Here, Bates students and survivors of the genocide in Rwanda gather for music and fellowship during Short Term in 2013. The survivors live at Tubeho, a collective of houses in Kigali where orphans of the genocide live in reconstituted families. 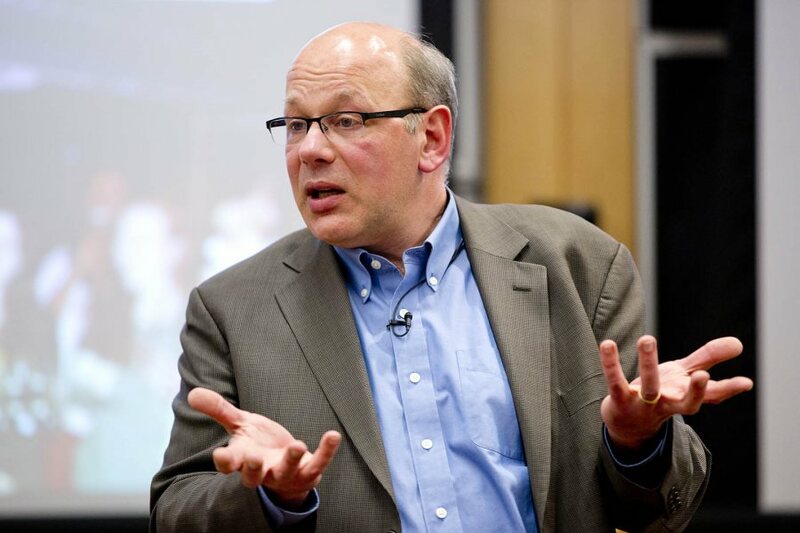 As he created his Rwanda-based courses for Bates, Dauge-Roth drew on three consequential lessons from his graduate work. First, trauma causes what he calls a “fracture within the self,” a break between one’s pre- and post-trauma selves that must be negotiated. So what does it take to be a listening community? Dauge-Roth offered three tenets (“I’m French — everything goes by threes,” he joked). First, it requires that we move past pity and compassion, “since these are just part of the strategy for maintaining the status quo.” Second, it means incorporating into our own histories the history of pain that we encounter. Third, it means that listeners “see themselves as indirect witnesses, whose responsibility is to develop a critical self-awareness regarding their own agency and inadequacy as they respond to survivors’ stories. Learning with the survivors” — not merely from; a key distinction for Dauge-Roth — becomes an “ethical gesture” that makes possible reciprocal relationships between survivors’ histories and our own.